Looking for river rafting places in India and things to know about river rafting like what is the ideal time to go for? Here we are some best places for river rafting in India along with the other details like best time, prices, accommodation and more. River Rafting in India is one of the most popular outdoor adventure activities in the country. Rafting in whitewater in an inflatable raft with the number of low and high rapids, getting splashed with cold water and enjoying the tranquillity of the river all are enough for adventure lovers. River rafting can be an extremely safe, enjoyable and exciting adventure sport almost for anyone, including non- swimmers and those with no prior experience can also go for rafting. Read on to know best places for river rafting in India, the adventure water sport. Thinking for going to river rafting, Rishikesh is the first name always comes to my mind first. Rishikesh provides a perfect landscape to enjoy enjoying river rafting and camping in India. One can enjoy river rafting of 9 km to 36 km with rapids ranging from grade 1 to grade 4. Best time for river rafting in Rishikesh is from September - October to mid-November, and from early March - April to the first week of May. In monsoon, rafting is closed because of the high levels of water in river Ganga. Prices for river rafting in Rishikesh varies from Rs. 840 to Rs. 1800 per person depending upon the distance e you choose. Other than river rafting one can also enjoy lots of Adventure Activities in Rishikesh like Beach Camping, Bungee Jumping, Flying Fox and Swing Activities. Rishikesh is also the best place for doing yoga and meditation in peace as it has lots of yoga and meditation center in Rishikesh. Brahmaputra River is the best places for river rafting in India for anyone who is looking for an exhilarating rafting and kayaking in white waters. River rafting at the Brahmaputra, Arunachal Pradesh is rated at Level 4 -6. Rapids such as the Pulsating Pulsi and Tooth fairy are the biggest push of adrenaline. The rafting expedition of the entire river takes more than a week to complete. Affordable Camping including in river rafting package is available along the river blessed with beautiful green tropical forests and local tribes. Best time for river rafting in Brahmaputra River, Arunachal Pradesh is from November to March, after the Monsoon. Prices for river rafting in Brahmaputra River Rafting Expedition is the little bit on higher end vary from ₹ 83,500 to ₹ 88,500 for the complete package including accommodation and all meals. 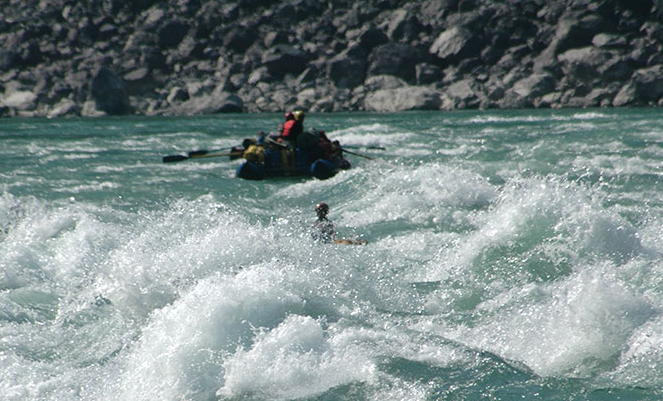 It is among one of the most difficult and challenging river rafting sites in India. 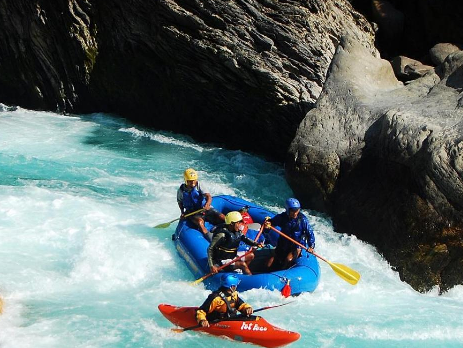 River rafting at Alaknanda is 7 days rafting expedition of 25 km between the Chamoli and Rudra Prayag. Hillary Fall, Kakad Fall The Wall, Three Blind Mice, Return to Sender, Roller Coaster, and Golf Course are some of the highest rapids of the expedition. The level of difficulty in this expedition is certainly high and meant for audacious people. Other than rafting, you can enjoy cliff jumping, body surfing, and beach volleyball as well. Best time for river rafting in Alaknanda River, Uttarakhand is from September to November and from early March to 2nd week of June. Prices for Alaknanda River Rafting Expedition vary from Rs. 28,500 to Rs. 30,000 per person for the complete package including accommodation in beachside luxury camp and all meals. Zanskar River is a tributary of Indus river flows at a height of more than 12,000 feet in Ladakh. River rafting in Zanskar River gives the opportunity to experience the natural beauty of the spectacular landscape, snow-capped peaks, hilltop monasteries, beautiful village and glimpses of the unique wildlife. The challenging rapids on the river range from grade 1-2 at some places, has grade 3-5 rapids. Best time for Zanskar River Rafting Expedition is from July to late August as at these are months river water levels are high. Prices for Zanskar River Rafting Expedition vary from Rs. 15, 00 to Rs. 3,000 per person depending on the distance you choose. Kali (Sharda) River forms the natural border between India and Nepal. Rafting in Kali River is an exciting river journey along the Kumauni and Nepali villages, sandy beaches, and thick tropical forests. Kali River Rafting Expedition starts from Pancheshwar and finishes at Tanakpur. It is an ideal River rafting destination for beginners as well as experienced adventurers as it has some small and big rapids, like the 'Chuka', 'Dimberghat' to thrill you. Best time for Kali River Rafting Expedition is from February to April and from October to December. Prices for Kali River Rafting Expedition vary from Rs. 2,000 to Rs. 5,000 per person depending on the distance you choose. Teesta River is the main river of Sikkim, Darjeeling, and Kalimpong Hill Region. It is a beautiful white water river and has large stones make it a perfect river rafting destination for both beginners and seasoned rafters. There are 6 grades or levels of difficulty depending on the rapids or the current in the river. Grade-3 and Grade-4 would have some large rapids so should be attempted only by professional rafters only. You should avoid the monsoon (July to September). All other months are good for rafting. The best time for Teesta River Rafting Expedition is from December to June. Prices for Teesta River Rafting Expedition vary from Rs. 2,000 to Rs. 5,000 per person depending on the distance you choose. The place is also popular for Paddle Rafting and Oar Rafting that are rare in other destinations. Barapole River Rafting is very exciting and fun filled event. It takes 2 hours to complete the 3 km rafting session. There will be five major rapids- The Morning Coffee (level-2), Grasshopper (level-3), Ramba Samba (level-2), The Wicked Witch (level-3) and finally The Big Bang (level-4). However longer rafting trips also known as half day trip is also conducted in the lower stretch of the river as long as the water level is favorable but it is only for professional rafters. 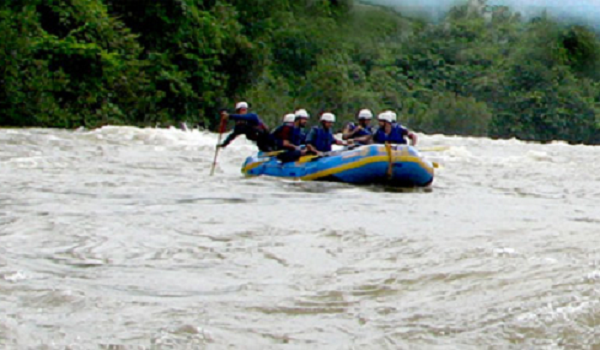 Coorg Water rafting season is open from Mid-June to Mid-October. Prices for Barapole River Rafting Expedition vary from Rs. 1,000 to Rs. 3,000 per person depending on the distance you choose. It is the only river rafting place which remains operational all-round the year. One can enjoy 10 Rapids range from 1 to 3 grade makes it an ideal destination for beginners too. It takes approximately 1 hour 45 minutes to complete the expedition. Prices for Kundalika River Rafting Expedition vary from Rs. 945 (Weekdays) and Rs. 1675/- per person (Weekends & Bank Holidays). 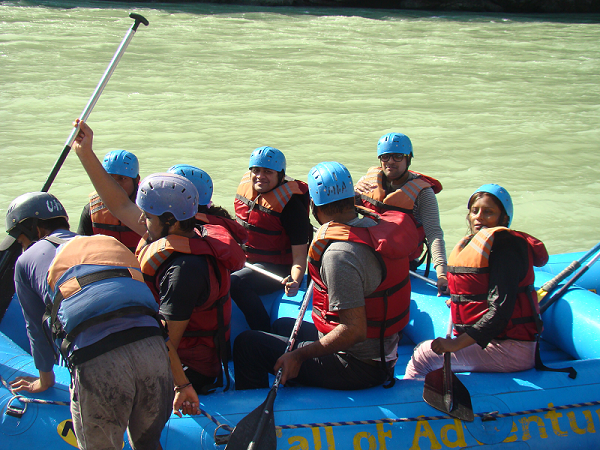 Beas River offers a very basic rafting experience to the rafters. The rafting stretch of 14 km on River Beas starts from Pirdi and conclude at Jhiri. River rafting expedition has 2 to 3 rapids provide light twists and turns to the rafters. It takes only 10 to 45 minutes to complete the expedition. Prices for Beas River Rafting Expedition vary from Rs. 450 to Rs. 800 depending on the distance you choose.